Zuzana and I are the odd couple – she 27 years old and a beauty, me at 60 feeling like an old woman for maybe the first time I my life. 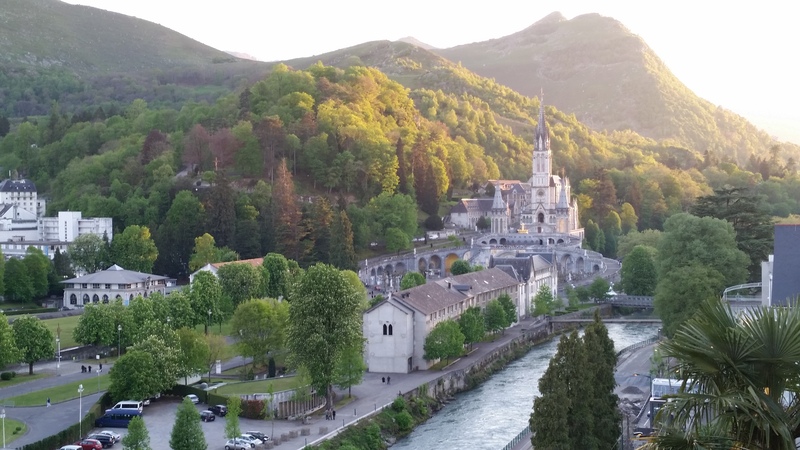 We met while walking Les Chemins de St Jacques – the Camino de Santiago – near Lourdes, France. She calls me her guardian angel but to me, she is my caregiver. She gladly lets me use her phone recharger and patiently assists me when I can’t get it to work. As she makes dinner for the two of us, I sit and talk about Camino etiquette while she chops fresh vegetables. “What is that word?” the native of Slovakia asks. “It’s French for something like ‘how to behave’,” I offer. I instruct her on blister care and she teaches me how to say blister in Spanish: ambule. Zuzana has been working in Spain for the past several years as an architect. Her command of the Spanish language is impeccable, but how would I know, I’m a bumbling student of the language? Zuzana is a vegetarian and nutrition nut; I’m having withdrawals from Lay’s Potato Chips. She’s getting me hooked on Chia seeds, “Breakfast of Champions” for Aztec warriors, or so claims the label. According to the package, Aztec ancients could run for fourteen hours on one meal of Chia seeds. When she asks me if I found her hiking pole tip, I pull it out of my pocket. 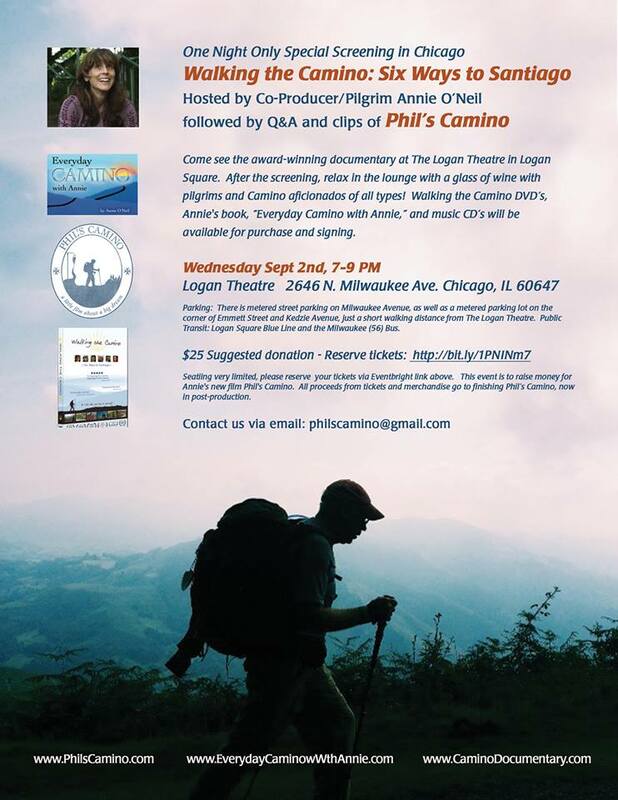 You see, she walks the pilgrimage route very much ahead of me. And I find the things that she drops: a hiking pole tip and a pair of socks pinned together with a clothes pin. 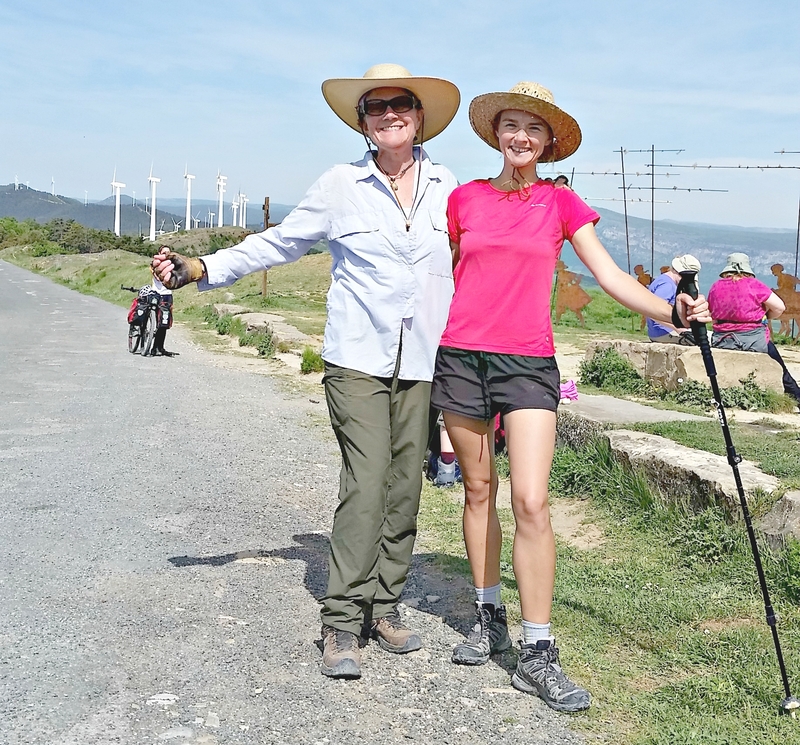 I actually met Zuzana’s socks before I met her – or anyone else – on this remote pilgrimage route. 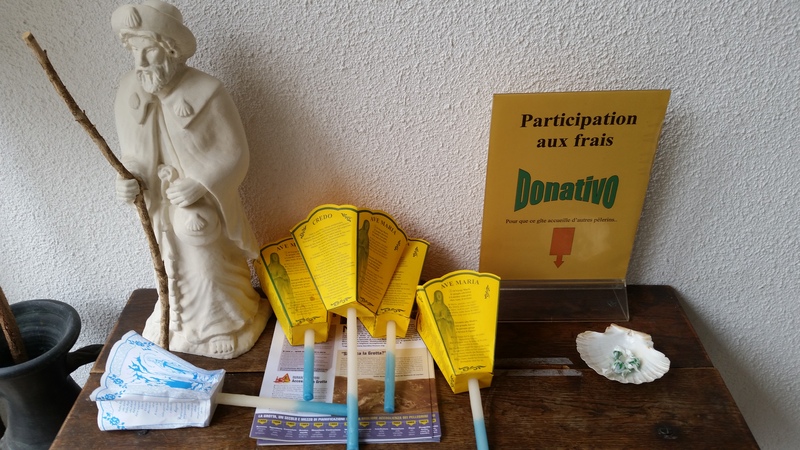 There are few pilgrims walking from Lourdes to St Jean Pied de Port, which is why Zuzana would make dinner for just the two of us – there were no others in most of the albergues where we stay. I found her socks on the first day out of Lourdes. They were lying in a rain puddle in front of a big sign describing the abundant nature of the surrounding area. I could tell that the socks had been recently dropped, so I picked them up. I toted them until the next day when long-legged Soren, with whom I was trying to keep up, begged me for the third time to get rid of some weight from my 30-pound pack. “Stacey, darling! You’ve carried all that long enough. It’s time you got rid of something! I don’t mean to lecture, or pontificate, but REALLY!” exclaimed Soren pontificating. “Oh, no. Go ahead — I need to hear it,” I interrupted. It was my second day of walking and both the temperature and humidity were high. The sweat was pouring down my red face. I left the socks and a baseball hat at a bus stop in a small country village. It wasn’t much to leave behind, but it was a beginning. 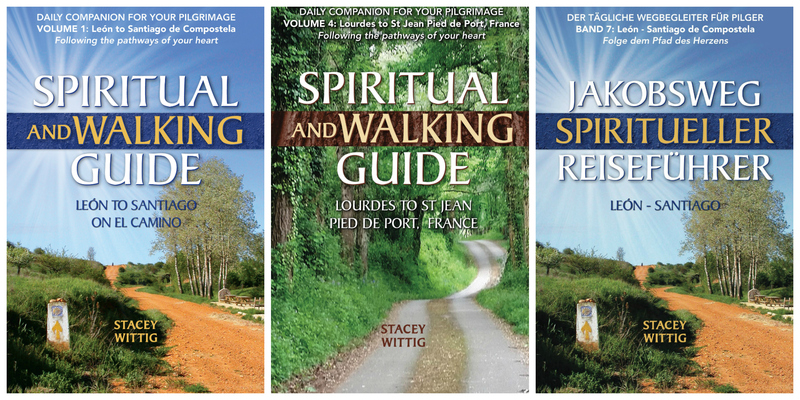 Eventually I would mail fourteen copies of my Camino book forward to Burgos, Spain. I carried the books so I could donate them, one at a time to albergues along the way. But since my book was a spiritual and walking guide for the last weeks of the walk, I really didn’t want to leave them until I got closer to the endpoint. I met Zuzana the following day, and when she mentioned that she had lost her socks, I shot a “look” to Soren. 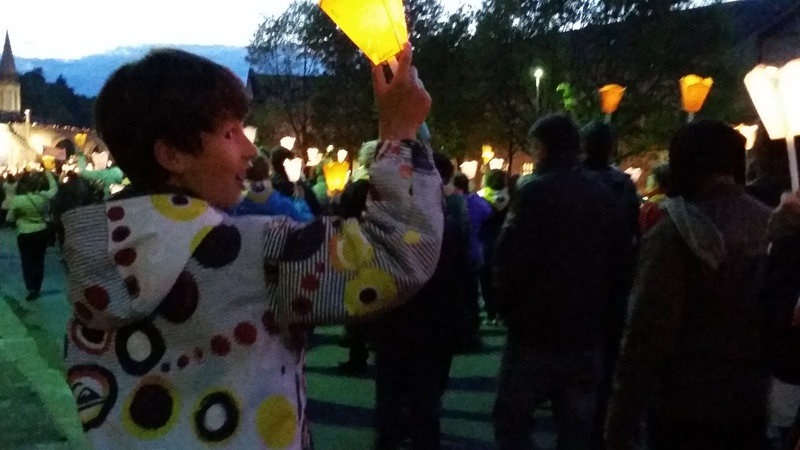 Later Soren, who planned to cross the Pyrénées at Somport, turned west and bid us goodbye. 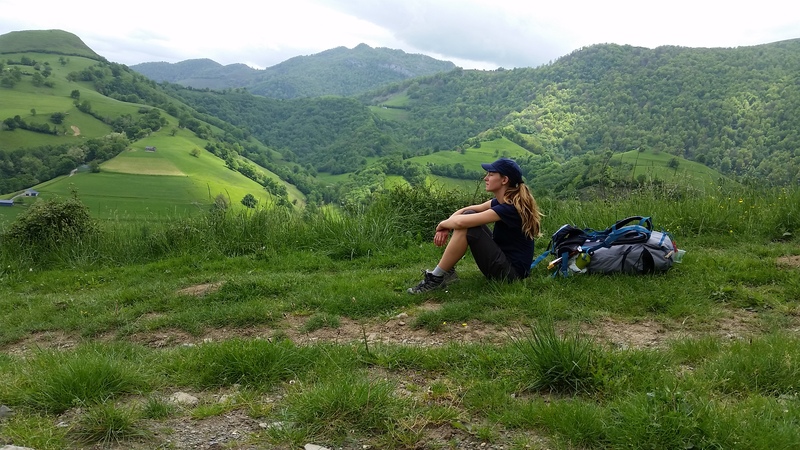 Zuzanna and I continued our walk north-ish along the foothills of the Pyrénées. It was the beginning of a beautiful friendship. Solo travel opens up possibilities for uncommon friendships. I would never guess that a young girl in the prime of her life would ever want to be friends with me, a sixty-year-old woman. 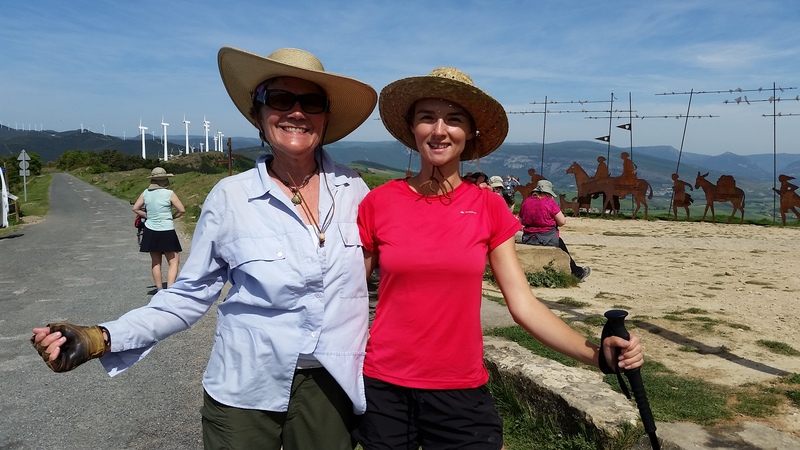 Yet the Camino brings together people who have something special to share with each other. Ionut Preda dripped a blood red drop of hot wax onto my pilgrim credential and then quickly pressed a metal sealer into the congealing liquid. His seal left the impression of two bare footprints on the passport-like credential that I carried with me during this 500-mile trek across northern Spain. This flimsy piece of folded paper proved that I was a pilgrim and allowed me overnight access to albergues or pilgrim accommodations. It was stamped and dated by albergue hosts to ensure that I didn’t sojourn too long in one town and overstay my pilgrim status. 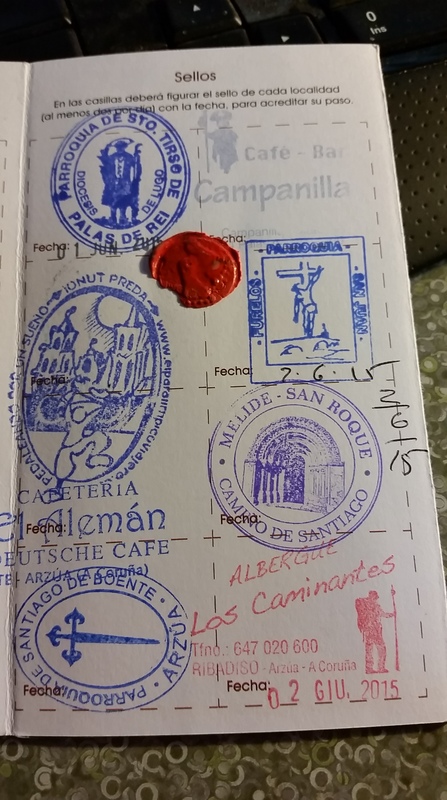 The credential was also proof that I had actually been to these places along the route so I could earn a Compostela from the Catholic Church at the endpoint, Santiago de Compostela, the resting place of the bones of St. James the Greater. “I love looking at my credential,” Robert from Holland had explained earlier. “I can tell you a story an hour long about each one of these stamps. 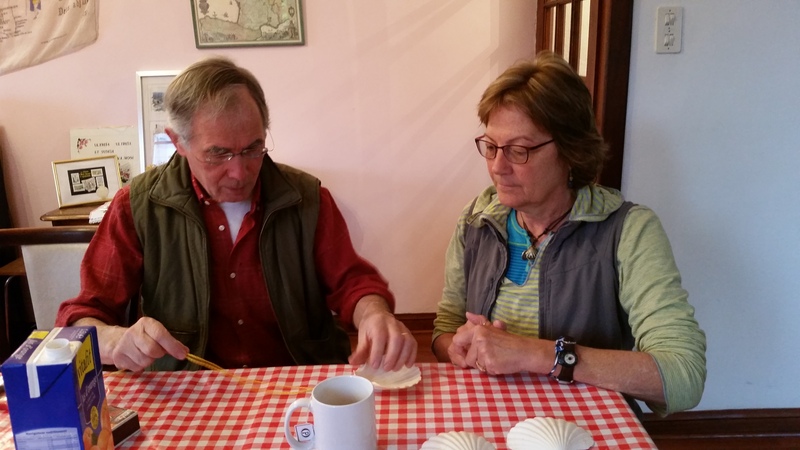 It is such a good way to remember my journey.” And so pilgrims like Robert and me collected stamps or sellos from restaurants, churches and wayside attractions like the one we were at now. Sometimes you had to pay an entrance fee to get the imprint from a rubber stamp, like at the cathedral in Leon. Other times you needed to be a paying customer to receive a stamp as at the bar at Orison. Yet at this humble wayside attraction, merely two banquet tables set end-to-end at the edge of the roadside, the extravagant wax stamp (the only I saw during my 36-day trek) was offered by donativo or freewill offering. From the table where Ionut Preda performed the stamping ritual hung several newspaper clippings. I bent down to look closely at the newspaper clippings. “But this man has only one leg,” I said. Ionut Preda stepped out from behind the table and raised his right leg, revealing a clunky prosthesis. 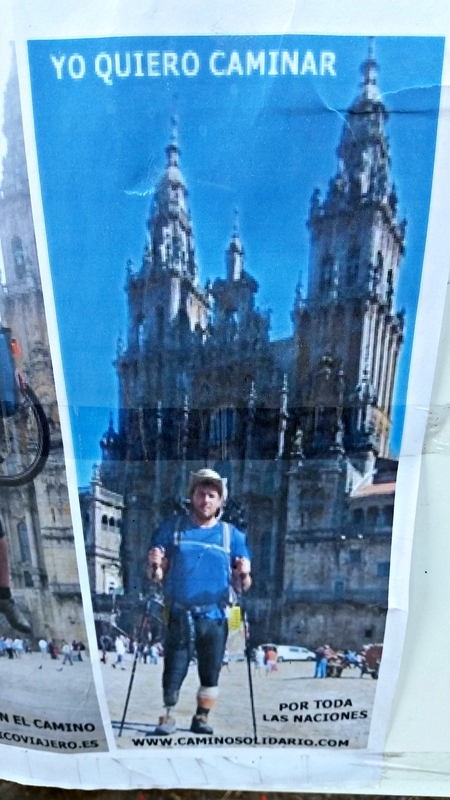 “I walked Camino de Santiago with this,” he said. I suddenly felt ashamed that I had been feeling sorry for myself because my feet were sore. 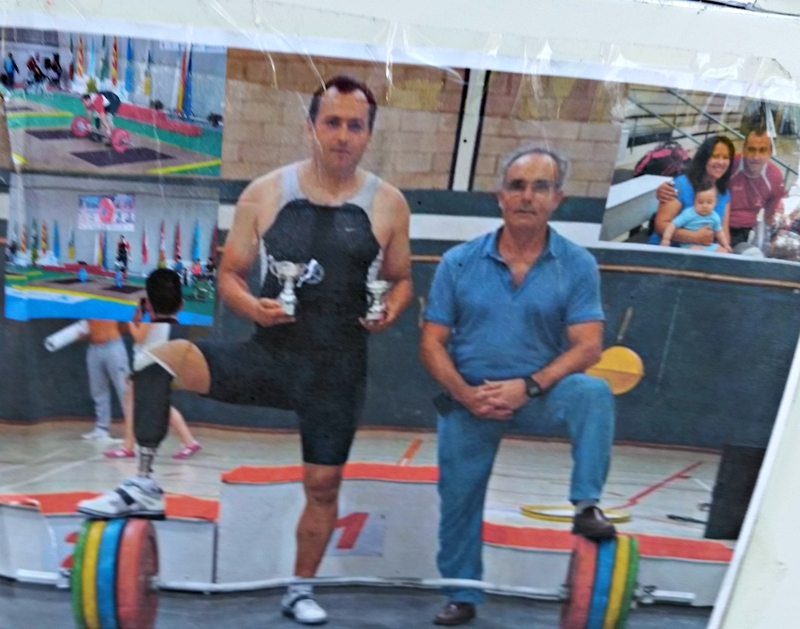 I soon learned that Ionut Preda was a very special man, a Paralympic athlete that worked with kids in his gymnasium that was located here, on the edge of the Camino de Santiago between Palas de Rei and Melide, Spain. The athlete who lost his right foot after an accident with a mechanical crane at age eight has overcome his loss to win more than 100 national and international medals. 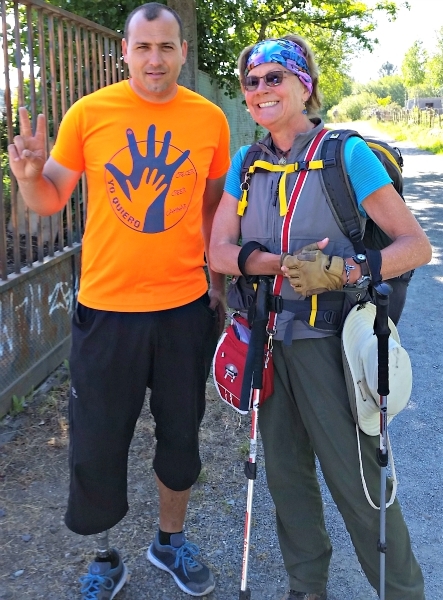 On the second table, Ionut Preda sold athletic shirts sporting his logo and slogan “Mas de Camino” or “More than a Road.” My companions and I bought the brightly colored shirts and continued on our way no longer tired, but refreshed from having met the inspiring athlete. Now when I look at my credential and see the imprint of two perfect bare feet, I think of the man with one foot who inspires children to be all they can be. Like Robert, I can look at that one stamp and tell a story that will last for an hour…or years.